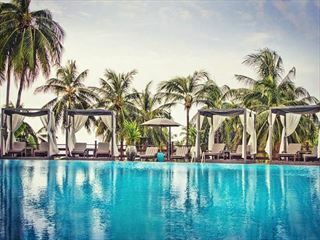 Mom Tri’s Villa Royale is a boutique hotel situated on a headland overlooking the Andaman Sea and the white sand beach of Kata Noi. It is a haven of peace and tranquility, exclusive for its guests with great personal service and fabulous food. A real treat. 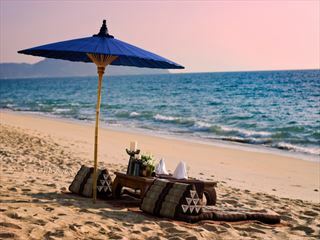 Thirty-five suites offer the highest standard of privacy and comfort in Phuket’s last hideaway. 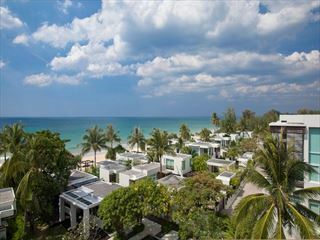 Alluring glimpses of its distinctive Thai-style buildings, authentic Thai antiques and art, luxurious modern comforts, panoramic sea views and lush tropical gardens create an atmosphere of calm and tranquillity. There are 10 types of suites to choose from, including private pool suites, in addition to Villa Terracotta a 4 bedroom private pool villa. A beautiful swimming pool and a superb spa are on offer with the enticing beach below. Mom Tri’s Kitchen: Fine dining on the covered Patio, open-air Garden Terraces, and Sala plus an award winning wine cellar of its own. An exuberant menu offers inventive, inspired, fusions of European and Oriental flavourings, Thai cuisine and European favourites. Indulge yourself in the romantic and sensual environment overlooking the open sea , the crystal water and white crescent of Kata Noi Beach. Sala Lounge: Located at Mom Tri’s Villa Royale and perched on the hillside above the rocky shoreline in a tranquil and intimate atmosphere looking onto the clear Andaman Sea.